Gripsweat - LED ZEPPELIN Led Zeppelin IV LP 1971 ATLANTIC 1st Press! MINT!! AWESOME!!!! 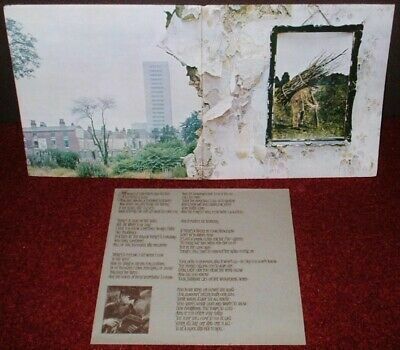 LED ZEPPELIN Led Zeppelin IV LP 1971 ATLANTIC 1st Press! MINT!! AWESOME!!!! NOT ONLY THAT BUT THIS LP IS IN ABSOLUTELY AWESOME CONDITION - AND HAS BARELY BEEN PLAYED AT ALL!!!! JUST TAKE A LOOK AT THE PICTURES!!!! THIS IS THE ORIGINAL 1971 UK 'EARLIEST' 1ST PRESSING ON THE 'EARLIEST' 1ST PRESS RED/MAROON (PLUM) LABELS (WITH COMPLETELY DIFFERENT TEXT! ), 'EARLIEST' 1ST PRESS FLIPBACK 'TEXTURED' INNER SLEEVE, 'EARLIEST' 1ST PRESS 3/3 MATRIXES, AND 'EARLIEST' 1ST PRESS GATEFOLD 'MATT' COVER!!!! THIS LP IS SERIOUSLY RARE AND VIRTUALLY IMPOSSIBLE TO FIND LIKE THIS - SO DONT MISS OUT ON THIS AMAZING OPPORTUNITY!!!! The Cat. No is 2401 012 on the ORIGINAL 'Earliest' 1st Press Red/Maroon (Plum) Atlantic labels (see picture) and is a Stereo 1st pressing (there were NO Monos!)!!!! All the tracks are Pure quality Led Zeppelin at their best!!!! Any fan of Led Zeppelin, or 60s music in general, will want to have this in their collection - especially in this condition!!!! The record labels are in SUPERB condition (see pictures) with NO wear, NO writing, and barely ANY spindle marks AT ALL!!!! IT IS VERY CLEAR THAT THIS RECORD HAS BARELY BEEN PLAYED AT ALL (only 2 or 3 times at the VERY most!)!!!! The vinyl is in AWESOME condition!!!! Most of these 60s/70s LPs had been to a lot of wild parties and are usually found totally worn out, and almost unplayable. This one is NOT and has NO scratches, NO hairlines, NO scufflines, only 2 or 3 absolutely ULTRA light TINY surface traces, and only a VERY few of the lightest paper scuffs only visible under light!!!! ITS AS SIMPLE AS THAT!!!! THE RECORD STILL RETAINS ITS ORIGINAL 'JUST PRESSED' LOOK AND LOOKS AMAZING!!!! It is also great to find that the record plays as STUNNINGLY as the visual with NO pops, NO sticking, NO jumps, NO hiss, and barely ANY crackle AT ALL!!!! The sound quality is simply SUPERB with NO distortion and NO groovewear either!!!! The record must grade MINT(Minus)!!!! AWESOME RECORD!!!! Believe me this record is NOT overgraded in ANY way!!!! I use STRICT RC grading standards - it is not in my interest not to!!!! Brillant!!!! The record also comes in its ORIGINAL 1st Press 'Credits' Flipback 'Textured' inner sleeve which is in STUNNING condition and is completely UNSPLIT with NO repairs either!!!! The ORIGINAL 1st Press 'Matt' Gatefold Cover is in AWESOME condition!!!! It has NO edge wear, NO spinal wear, NO splits, NO sticker tears, NO sticker marks, barely ANY corner wear AT ALL, NO ringwear, barely ANY creases AT ALL (cover is VERY flat looking indeed! ), NO rubbing, NO annotations, and NO writing!!!! The opening edges are beautifully straight with NO feathering!!!! Even the inside of the cover is in AWESOME condition with NO grubbyness, NO yellowing, NO ringwear, barely ANY rubbing AT ALL, and NO writing!!!! The cover must grade Excellent++++ if not MINT(Minus)!!!! AWESOME COVER!!!! THIS LP IS SERIOUSLY RARE AND VIRTUALLY IMPOSSIBLE TO FIND LIKE THIS (ESPECIALLY AS THE 'EARLIEST' 1ST PRESSING EVER MADE!) - SO DONT MISS OUT ON THIS INCREDIBLE OPPORTUNITY!!!! FAUST Faust 1st LP 1979 RECOMMENDED - RR ONE - COMPLETE!! MINT/UNPLAYED!!!! VAN DER GRAAF GENERATOR Wave To Each Other 1st LP 1970 CHARISMA 1st Press!!!! GROVER WASHINGTON JR Mister Magic LP 1975 KUDU 1st Press! A1/B1!! MINT!!!! JERI SOUTHERN At The Crescendo LP 1959 CAPITOL MONO 1st Press!! BRILLIANT!!! !